One of Chamberlain School’s own has been nominated for this year’s Edwin Parr award. 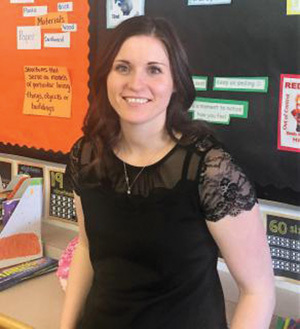 Taylor McKechnie, a Grade 2/3 teacher, was nominated as the Horizon School Division nominee for this year’s award for best first-year teacher. “I’m very honoured and very humbled to be the nomination for the school division. I wasn’t expecting it, I’m very appreciative and honoured they chose me for this award because there’s a lot of great teachers in the division,” said McKechnie on her nomination. Hailing from Rainbow Lake, Alberta, McKechnie graduated last year from the University of Lethbridge with a Bachelor of Education degree. During her final year at the U of L, she completed her final practicum with Horizon and got offered a job to start the 2017/18 school year in Grassy Lake. McKechnie knew from an early age she wanted to be a teacher, but upon entering university, she had thoughts of continuing her education further. “I’ve always wanted to be a teacher since I was a little kid. I went through high school doing jobs where I got to teach and be with kids. When I went off to university, I had plans to do another degree and realized how much I missed being around kids. That’s when I decided to do my Bachelor of Education,” she said. With any new job right out of school, there might be some nerves, but McKechnie has jumped headfirst into her job at Chamberlain. On top of her Grade 2/3 duties, she has added many other jobs to her list at the school. Since she started in the fall of 2017, McKechnie has made her mark at the school, hence the nomination for the Edwin Parr Award. While all teachers are different with how they teach and interact with their students, McKechnie has her own set ways of approaching teaching. One of the biggest factors when running her classroom is getting her students up and about as much as possible during the day. “I like to get the kids out of their desk and moving. We have a lot of flexible seating in my classrooms, so I actually have tires in my classroom. I have benches, we have carpet, we have tables with sitting on the floor, desks, standing desks, anything to get the kids outside or letting them have fun without really realizing they’re learning,” she continued. Even though her teaching career has just got its start, there is still plenty of reasons for her to look to the future. It may be hard to predict what she may be doing in five to 10 years, but she’s confident you will still be able to find her in a classroom. “I will probably still be teaching, what I’ll be teaching I can’t really say, I just want to continue to hang out with kids. Maybe a principal or (going) on my way to get my Masters of Education,” said McKechnie. The banquet ceremony for Zone 6 nominees will be held on Wednesday, May 9, at the Taber Heritage Inn, with one finalist being selected to compete for the provincial award. Edwin Parr lived in the Meanook area near Athabasca in 1920, where he started a career in educational affairs as a board member with the George Lake School District. He served as chair of the board with the Athabasca School Division, was president of the Alberta School Trustees’ Association from 1956 to 1962 and was on council of the County of Athabasca from its formation in 1959 until his death in January 1963. During his career, he started an Annual Teacher Award in his school system, where each year, a teacher was chosen to receive a gold watch and a certificate for their long and commendable service. The Alberta School Trustees’ Association established the Edwin Parr Teacher Award in 1964, to honour his work in his profession.